Projection Artworks is a full service creative studio specialising in projection in its many forms, from 3D, 4D, indoor and outdoor mapping, to event, advertising and architectural projections, video walls, installations and immersive, 360-degree displays. “the lighting conditions and projector setup were unlike anything I've ever worked on in 10 years of making content for projections, so we had to rethink our grading process to allow for the incredibly bright projectors and the daylight/ night conditions." 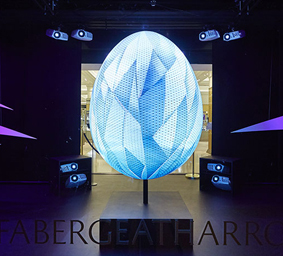 Challenge: To create a stunning projection mapped luxury Faberge egg for Harrods’ shop window for Easter 2015. 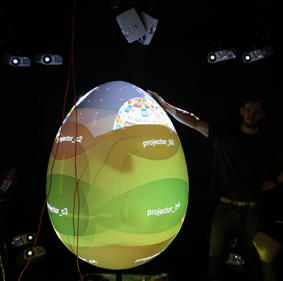 Solution: Projection Artworks and JUSTSO created a 360-degree projection mapped Easter Faberge egg using 16 Optoma projectors and a d3 4 x 4 Pro media server. Results: The dramatic effect of the projection mapped egg stopped passers-by in their tracks. 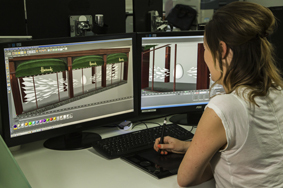 To create a stunning projection mapped luxury Faberge egg for Harrods’ shop window for Easter 2015. Projection Artworks and JUSTSO created the stunning 360-degree projection mapped Easter Faberge egg for the famous Knightsbridge department store using 16 Optoma projectors. Stuart Henry, international window designer, conceived the idea of a virtual egg for Faberge’s Easter window. Stuart and his team at creative agency, JUSTSO, visualised an interactive projection show on a 1.5 metre 3D egg-shaped model, and commissioned Projection Artworks to produce the digital content and projection element. The project represented a technical challenge for Projection Artworks and Optoma, which provided the projectors for the month-long installation. A genuinely daylight visible projection was created using Projection Artworks’ DisplayMapper technology, which works by applying large amounts of light to relatively small areas. The Faberge egg was covered with an unprecedented 14,500 lumens/sq metre, around 200 times brighter than a typical outdoor building projection. The projection was made possible by the d3 4 x 4 Pro media server, which can simulate every aspect of the production in the studio before arriving onsite. Initially the challenge was to create ultra-high resolution 360° photos of the egg pendants, which in real life only measure approximately 15mm in height. This presented major issues with depth of field, and each egg required 64 photographs from different focal lengths to create the highly detailed 360° models required. The final animations were then rendered out in 16 HD resolution to properly show off the giant egg in all its glory, 100 times the size of a real Faberge pendant. 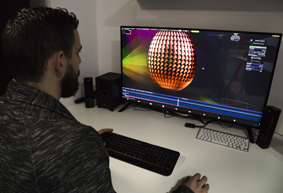 Projector alignment was a challenge as the egg model has no defining corners, but a seamless output was facilitated by high resolution 3D scanning technology. The display also incorporated an interactive touch-screen element to showcase Faberge’s jewellery designs. 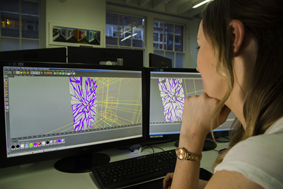 Projection Artworks’ animation studio and in-house development team worked together to create dramatic interactive content that allows Harrods shoppers to explore the world of Faberge via a custom-designed touch screen. 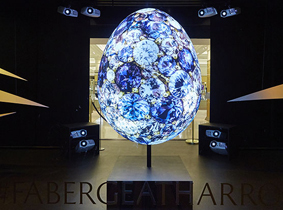 Shoppers choose their favourite Faberge design and watch a personalised 3D projection show unfold before their eyes, inspired by their selection. In total, 10 exclusive new designs are showcased in emerald, ruby, sapphire and diamond variations. The installation took place between 28 February and March 27 2015.